What a week for sports – everything from football (naturally, after Super Bowl wrap-ups), baseball and basketball to golf, skiing, gymnastics and the Olympics. Enjoy! Benjamin Melzer, transgender fitness model, won the 2016 Men’s Health cover model contest photoshoot. He’ll appear on the April issue of German’s Men’s Health. Free agent and veteran MLB outfielder Delmon Young was arrested in Miami this past Sunday and charged with one count of battery for allegedly choking and threatening to kill a valet employee at the Viceroy Hotel. Former MLB pitcher James “Mudcat” Grant is being honored with an honorary doctorate of humane letters from Whittier College for his athletic accomplishments and dedication to researching the history of blacks in baseball. Severe leg injuries to New York Mets shortstop Ruben Tejada and Pittsburgh Pirates infielder Jung Ho Kang last season have prompted Major League Baseball and the players union to consider changing the rules for sliding into second base. It’s possible a rule change could be in place by the start of the 2016 season. LeBron James passes Paul Pierce for 15th on all-time NBA scoring list. During Wednesday’s game between the winning Cleveland Cavaliers over the LA Lakers by 120-111, LeBron James made history by passing Paul Pierce to gain the 15th spot on the NBA’s al-time scoring list. Malcontent Suns player Markieff Morris’ latest incident is shoving teammate Archie Goodwin in the huddle on the bench during a timeout in Wednesday night’s game against the Golden State Warriors. Morris needed to be restrained. It remains to be seen whether or not the Suns will keep Morris going forward. During the fourth quarter of the Heat’s loss on Tuesday to San Antonio Spurs, Heat player Hassan Whiteside was ejected for an elbow to Spurs center Boban Marjanovic in apparent frustration. Whiteside left the arena before the game end and players returning to the locker room. Heavyweight boxer Antonio “Magic Man” Tarver has reportedly tested positive for synthetic testosterone prior to his fight with Steve Cunningham last summer in New Jersey. According to Chris Mannix of Yahoo Sports also reports Tarver has been suspended six months and fined $50,000. The suspension won’t be lifted until the fine is paid – a problem for Tarver since he’s also in hot water for unpaid child support. On Saturday night prior to last week’s Super Bowl, the “NFL Honors” award program not only honored current players, it also was the time the members of the 2016 Pro Football Hall of Fame class were announced. It included Cam Newton winning both the AP Offensive Player of the Year and the AP Most Valuable Player; Jameis Winston taking the 2016 NFL Rookie of the Year and Eric Berry accepting the AP Comeback Player of the Year from Leah Still, both of whom are cancer survivors. 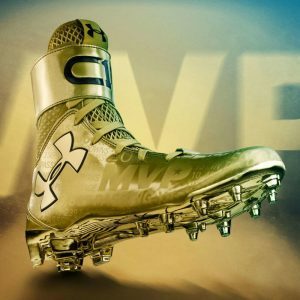 The Under Armour C1N “MVP” is all gold, has many of Newton’s accolades in bold letters on the upper part of the cleat with black accents on the Under Armour and C1N logos. Fans can order signed pairs of these cleats for $500 by calling 888-266-4630. Fifty percent of the proceeds will be donated to the Cam Newton Foundation. In spite of being the oldest quarterback to start in a Super Bowl, 39-year-old Peyton Manning guided his Denver Broncos to a win in what is most often being referred to as an ugly win or the worst Super Bowl ever. While most people expected Manning to announce his retirement, he refused to say one way or another at this time. Here’s the video of Carolina Panthers QB Cam Newton showing his curt answers, ignoring some questions and finally his abrupt walking out. A Broncos fan charged $21,000 for four Super Bowl 50 tickets for him and three buddies … without telling his wife! WOW – this is an impressive group of rings! According to Mike Silver of the NFL Network, a Browns player told him Johnny Manziel showed up drunk at a Wednesday practice late in the season and the Browns “lied” and said he was in concussion protocol. Mike Pettine, the former coach denied the charge. The Cleveland Browns denied a report Tuesday from Mike Silver of the NFL Network that the organization lied to cover up Manziel coming to practice while drunk. Silver later tweeted he regretted saying the Browns lied about the concussion but still maintains Manziel was drunk. 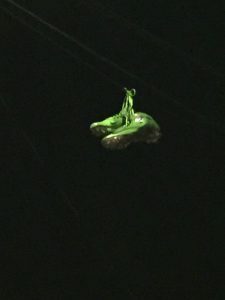 In the middle of the Super Bowl, Seahawks running back Marshawn Lynch, aka “Beastmode,” apparently retired in what is typical Lynch fashion – just a picture of his cleats hanging from a power line – no words. He has told friends he intends to retire. Don’t worry about Marshawn Lynch being able to make it after retiring from the NFL since he hasn’t spent one penny of his $49.7 million in salary from the NFL. He’s been living the past nine years from his income from endorsement deals and other business ventures estimated at about $5 million a year. NFL commissioner Roger Goodell has recommended to the league’s competition committee that any player who is penalized for two personal fouls in the same game should be automatically ejected. The issue will be further discussed with the NFL Players Association and the competition committee. Much to the delight of any number of NFL players, the league is again considering eliminating the annual Pro Bowl if the quality of play doesn’t improve. Many top players withdrew before the game and TV ratings were down. Philadelphia police recommend criminal charges against Bills running back LeSean McCoy stemming from an alleged assault on two off-duty police officers in a club early Sunday morning. The NFL has begun its own investigation although McCoy likely won’t be placed on paid leave because he’s not currently with his team. Swiss skier Nicolas Vuignier tried to capture his skiing runs for two years before figuring out how to attach his iPhone to a string and spinning it around. This footage is amazing. Sophina DeJesus, a UCLA gymnast performs a flawless floor routine that combined flips and tumbling runs along with her hot dance moves. According to the Canadian Concussion Centre, the brain of deceased NHL enforcer Todd Ewen didn’t show signs of chronic traumatic encephalopathy in spite of suffering several concussions during his playing career. He died at age 49 on September 19 of a reported self-inflicted gunshot. UFC officials have announced a $1 million to the Cleveland Clinic’s Lou Ruvo Center for Brain Health in Las Vegas as part of a continuing commitment to supporting the center’s Professional Fighters Brain Health Study. With the outbreak of the Zika virus in Brazil and its possible link to microcephaly in babies born to mothers who contracted the virus while pregnant, Hope Solo, goalie for the U.S. women’s national team said, “If I had to make the choice today, I wouldn’t go” to the Olympics. Six women filed a federal lawsuit on Tuesday against the University of Tennessee (UT) claiming that it has created a student culture that enables sexual assaults by student-athletes, especially football players, then uses “an unusual legalistic adjudication process” that’s biased against those making the claims. UT is the latest major university sued under federal Title IX rules.